SQUASH: Leading Australian female squash player Donna Urquhart is excited to step on the glass courts at Gold Coast's Movie World Studios with the Commonwealth Games on the horizon. 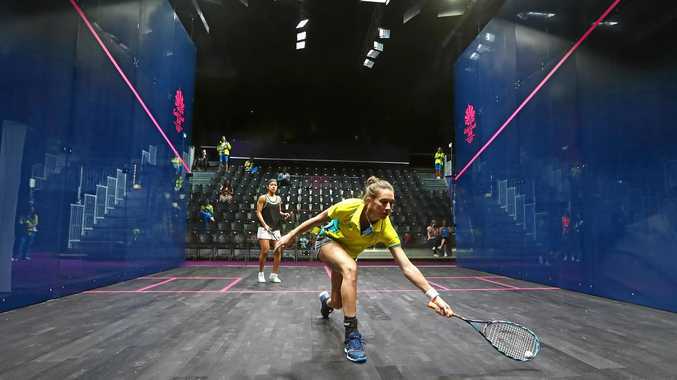 The Yamba squash star has been in the athlete's village since midway through last week, and said the Australian team had made early use of the specially constructed glass courts at Oxenford Studios. "We have been getting in a few long sessions on the glass court this week,” Urquhart said. "It is going to be great for the spectators. Urquhart will team up with Australia's Rachel Grinham in the female doubles competition and fellow Yamba-born international squash star Cameron Pilley in the mixed doubles competition. "Because we play most of the season in singles competition on the world tour, it takes a bit of time to brush off the doubles rust and find our timing,” Urquhart said. Urquhart will also feature in the women's singles draw, seeded seventh for the competition, and will meet Pakistani Faiza Zafar (unseeded) in the Round of 64 on April 5. Gold Coast will be the third Games for the 31-year-old but she said the excitement of the athlete's village had not left her. "The entire squash team moved into the Village on Wednesday, and it already feels so busy,” she said. "I don't know what percentage of athletes are here, but I haven't seen a lot of different nations around.